Clean concise information to help you plan for & register on November 2nd @ 9:00 am (EST). Below is a LOT of information. Being that most emails this day are not read in their entirety, I invite you to brew some coffee, sit down and relax as you read through what can hopefully give you some ease on registration day. 1. REGISTRATION LINK: The registration link for returning families was sent via email and the US Postal Service to all returning families. You should have received this information already. Please contact our office if you did not receive it. Please continue to hit refresh and once space becomes available on the site, you will be able to register and log in. If, at this time, you anticipate concerns with your child’s division assignment based on grade level, please contact us immediately so we can discuss this further with you. 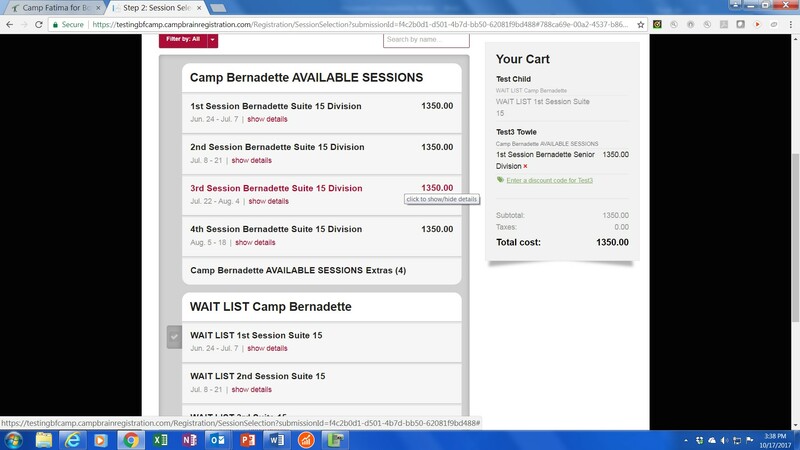 WAIT LIST: The wait list is now on line! You may know some sessions fill up VERY quickly; in only minutes last year. In the event you log on line to register and the session which you are interested in is not listed, we encourage you to select from the wait list option for that session. PLEASE NOTE: The wait list sessions will be listed below the available sessions (SEE BELOW) and are clearly indicated. The waitlist you register for will be confirmed at your check out. The wait list registrations will be date/time stamped so that in the event a spot opens, we can contact the next person on the list to offer the spot. READ CAREFULLY: an error in selecting a waitlist session verses an available session will not be able to be crossed on our end. If the session is already full, it will NOT be available for your selection. Here is a link for the waitlist screen shot (notice the available sessions on the top and the wait list sessions below):At this time, there is NO OBLIGATION to register for the wait list. If there is a session you were not able to register for, I encourage you to register for the wait list. What if I registered for the wait list? We will not be running a wait list report until November 6th. Please do not contact us prior to this date regarding your child’s status as we will not have access to it. After this date, please feel free to email Sara at ssmith@bfcamp.com to inquire about your status. Please know that we will be sure to contact you if/when a spot opens. Remember, we want your camper here! If a spot opens, we will call you. The wait list does not generally change until March. In future months, Sara will run the report on the 1st and 15th of each month. We are happy to update you at any time, but these are the report dates we will reference and again, we will contact you if/when a spot opens for your camper. BUNK REQUESTS/CABIN MATES – this year you will not need to worry about this until May 1st. At that time, we will send you information on how to select your bunk requests. You will be able to select two names per registered session. This will allow you plenty of time to know who is registered and who you would like to bunk with. We know that sessions are added and cancelled throughout the year and this can sometimes affect your planning. This change will allow you plenty of time for determining who you might want to bunk with. Miscellaneous Session Options (Including: laundry, change weekend, Suite/Club 15 trip) – For those registering in our Suite/Club 15 divisions, please know that the system will automatically register you for the Suite/Club 15 Fee. This excursion fee is part of the Suite/Club 15 camper program/experience and is $50.00. On registration day you will have the option to register for the Long Island bus. For details on the Long Island bus, please click this link: Long Island Bus Information. If you are not sure of your transportation needs at this time, please know you may register for the bus at a later date by contacting our office. The last date to guarantee a reservation is June 15th. Additionally, no reservations refunds will be given after June 15th. For those of you with campers staying for consecutive sessions who may desire our laundry and the change weekend trip services, please know that we will be sending an email on May 1st giving you an opportunity to select these services. A) Register your daughters first (oldest to youngest) then register your sons at Fatima. B) Save the date and the link for ease of access on that day. C) We have heard that people were not able to connect for various reasons including: lost service when going through tunnels, work computers blocked access to the registration site. 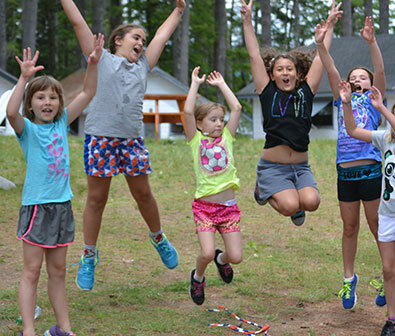 D) We ask that you remember we do all we can to allow for your camping experience to be a great experience from registration day through camp checkout day. When sessions are full, we do not have the ability to create additional beds and know this can be heartbreaking. Some families find it helpful to discuss the reality of this happening ahead of time so that their child can understand our wait list process, etc. That is about all we can think of at this time. It is a lot of information, but will be valuable should you need to reference it.